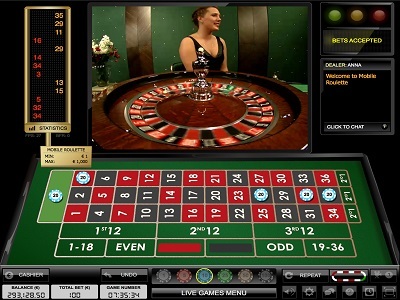 Live Roulette Casino – Play the best live roulette casino games straight out of the comfort of your house, office or on the way. Now a day you can place bets via your mobile phone too. Simply select your favourite live roulette game on your cellphone. 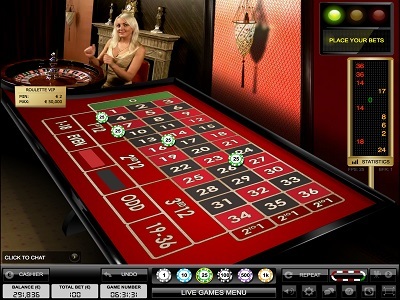 You are just one click away from playing exciting roulette games at the best live casinos, play and win! Play against live dealers. All roulette games are streamed in real time directly form the best casino studio’s in the world. Secured software monitors your bets and guarantees 100% safety! The favourite, and undoubted, most famous casino table game in history of gambling. Originated from France and since 1700 played all over the world! The place to be when one wants to enjoy some thrilling gaming action every once in a while. 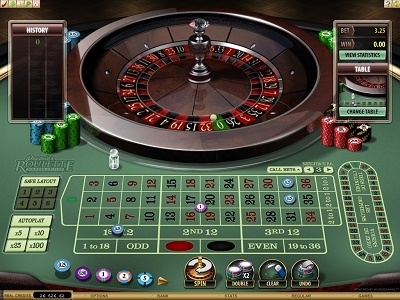 Regardless whether you are a novice or seasoned player, casino roulette is accessibly for all! Heard of the “advantage of the house” when playing at roulette casinos? Play the most thrilling casino game at the best live roulette casino websites! European Roulette should be the game of your first choice. Simply because this roulette version has the lowest house-edge. 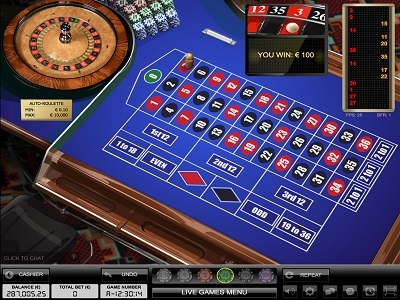 Because of the single zero (0) in the game the advantage of the casino is below three percent. Obviously you want to get the best chance of winning when playing online live roulette, hence the European (or French) games are best to play. In general all bets placed at the roulette table have an “equal opportunity”of winning. However there is one betting pattern that gives the casino the highest advantage, the Five Bet on American tables. This bet is a combination of bets placed on 00,1,2 and 3. Unless you are in for a big risk (which might result in high winnings!) we suggest not to place this bet. There is a way to lower you risk of losing with a small percentage. To get this advantage you have to choose a live roulette casino that offers the ‘En Prison‘ (French for prison) rule. By playing with this system you get half of your chips back when the boulette (ball) pockets the zero (0). Because your chip is “fixed” on the table it seems that it is “imprisoned”. If the boulette pockets the zero again in the consecutive round you loose your bet and are all fields emptied and the table is ready for the next round of bets. So although “staying in prison” is usually not something to look forward too in this case it helps. Just as with the En Prison rule you also loose half of your bet with La Partage. In this case however you can not leave your chip at the table so the outcome of the consecutive round is irrelevant. An additional rule is that you can only redeem La Partage bets on Red, Black, High or Low bets and Odds or Evens. Have you placed your stakes on one of the previous mentioned bets you receive half of your bet back. The basics of Roulette are quite simple and some might even consider it a boring game. To avoid people getting bored the French have modified the game over the years. (Good example are the En Prison and La Partage rules. But there is more. One of the additional “improvements” was adding the possibility to place Neighbour Bets on roulette. 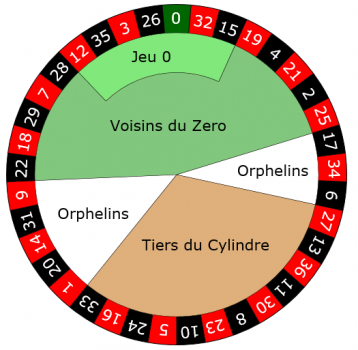 More specific the Voisins du Zero, Tiers du Cylindre and Orphelins bets you can place when playing French Roulette. In most English speaking countries Neighbour bets field is commonly know as the Race-track. See a Race-Track picture here under. It is the Race-Track (Neighbour game-field) that adds to the attractiveness of live roulette casino games. In addition to the best one can place in the Numbers (straight bets), Red/Black, Odds/Evens, Dozens, Corner bets), Line bets, Column bets, Splitting and the High/Lo wagers the Race_track offers much more betting options. ‘Orphans‘ are those bets that one can’t find in the Voisins du Zero (big series) nor the Tiers du Cylindre (small series). The numbers covered bij the Orphans are 9, 31, 14, 20 on one side. And 17, 34 en 6 at the other side. ‘Voisins du Zero’ (big series) is the sequence of the numbers 0-2-3-4-7-12-15-18-19-21-22-25-26-28-29-32-35. Obviously this is bot ad-random. If you take a closer look you notice these are “the neighbours“of the zero. ‘Tiers du Cylindre’ (small series) those are the bets laying directly opposite of the Big Series. Both are separated by the “Orphans”. The small series consist of the numbers 5/8, 10/11, 13/16, 23/24, 27/30 and 33/36. As one can see on the picture on the left these numbers cover exactly one third of the wheel. Hence the name “third of the cylinder’. Playing Roulette on the race-track might seem a bit overwhelming to some players but trust us it’s easier then one might think it first glance. 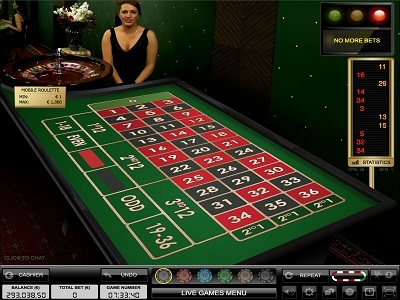 There are live casino’s offering the Neighbour bets option but mostly you’ll find it on the traditional software versions of French or European Roulette. US online casinos mostly offer the Race Track field at their games. 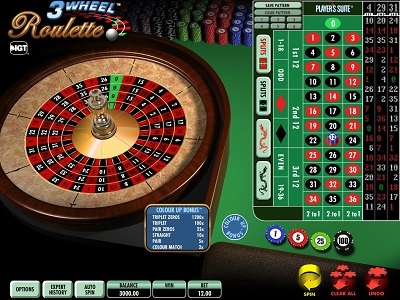 Live roulette casino games or you prefer the software versions? 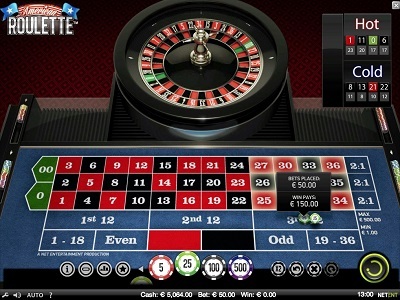 Loads of people that haven’t played online roulette yet wonder what the difference between Live Roulette Casino and a software only casino actually is. Well… there is quite a difference! Below you can find the difference in a glance. Note: bear in mind that both versions make use of software as the whole web is based on software. The majority of the roulette player prefer live roulette games. Simply because it offers the best gaming experience. There are also players that opt for live games as they don’t trust software version as they think it is manipulated. This is a myth. A genuine licensed casino will never offer rigged roulette or other casino games. All software used by online casinos is tested on a regular base and certified by independent authorities. Software games are just like Playstation or Nintendo. Programmers develop a game en write down the code that creates a game. Graphic designers create the images that finish the game and make it visual. To top it of a Random Number Generator (RNG) makes sure the outcome of each spin is random and chances of winning are equal to each player.